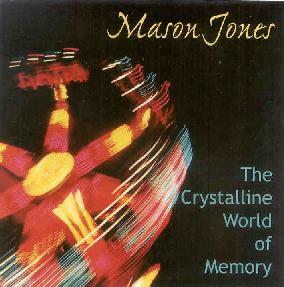 Mason Jones - "The Crystalline World Of Memory"
On The Crystalline World Of Memory, SubArachnoid Space guitarist Mason Jones lays down nine tracks of solo guitar recorded direct to DAT in 2002. The only other solo disc from Jones I've heard is 1998's International Incident, which featured Jones exploring his interest in much harsher noise realms. This current release, though equally exploratory, is a much trippier psychedelic voyage by way of ambience, atmosphere, sound sculpture, and even melody, though rock elements crop up as well. The tracks have titles but I found myself largely indifferent to them as each mostly melted into the next, making for a continuous 45 minute journey into trip guitar bliss. Throughout the set we are treated to rumbling ambient drone waves and bubbling psychedelic dances. The music travels in a decidedly linear direction, creating dense walls of sound and sometimes with a clear sense of rhythm and perhaps even song. It's dark... urgent... but highly trippy. There are also some seriously lysergic moments of dripping liquid psychedelia against background drones and tripped out space waves. A couple tracks did stand out on their own. On "The Crystal View" Jones lets it rip, going off into a rock jam. "That Which We Leave Behind" is a continuation of this theme that gets more sonically devastating, like the moment in a 70's rock concert when the guitarist stood alone on stage and just jammed away. No breathtaking solos here... just loud and heavy guitar-scapes played in an acidic Hendrix-like style. And the aptly titled closing track, "The Difficult Life Of The Interstellar Loner", is mucho cosmic but a little different from the rest as it's more on the experimental side. Jones' guitar is like a spacecraft drifting leisurely and treating us to all the little bangs, whooshes and clatters that you might hear in cold, dark space. An interesting blend of soundscape experimentation and head massage. In summary, this is a tasty set for guitar lovers that will provide lots of psychedelic ear candy for a headphones experience as well as providing countless rewards for the attentive listener.